While it’s seriously rude for wedding guests to no show at your ceremony and reception after they’ve RSVP’d yes, don't out-tacky your guests. 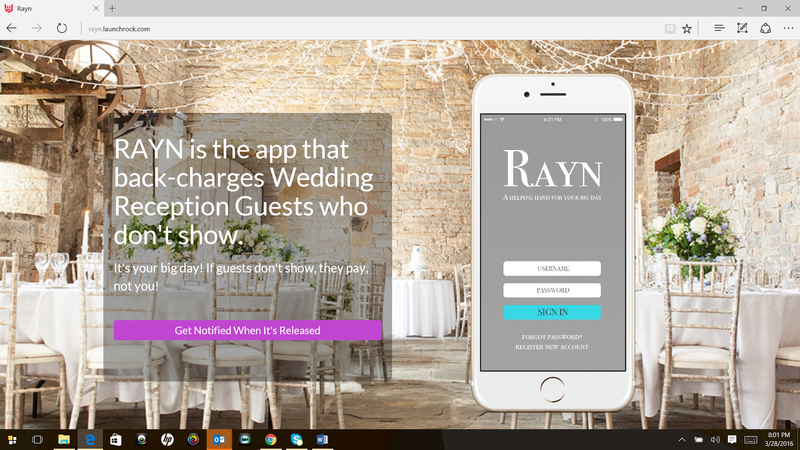 There's a new app that makes it easy to bill your no-shows for their spot at your wedding! And Sandy says it’s totally unacceptable. Just say no! You can register for pretty much anything for your wedding now, not just china and silver. Sandy explains why it’s important to choose stores that have the things you need and want, and to investigate their wedding registry return, exchange and completion policies before you start your wishful shopping. If you’re planning to do something different in the landscaping of your bikini region for your wedding, Sandy recommends you experiment – in advance – so that you don’t end up with raw, uncomfortable skin during your wedding weekend and honeymoon. New in bookstores, “How to Plan Your Own Destination Wedding: Do-It-Yourself Tips from An Experienced Professional” written by Sandy Malone. It’s the first time an expert destination wedding planner has provided a step-by-step guide to DIY-ing your wedding, but the advice in the book applies to all kinds of events, away and at home. A must-read for anybody who is starting to plan their wedding! You can find Sandy's book wherever books are sold, or online, like on Amazon.com. It’s super-tacky to invite anyone to a wedding pre-party if they’re not invited to the actual wedding. Sandy says don’t make up any engagement party or bridal shower guest lists until the wedding invitation list is final because there’s not much that is ruder than asking for a gift from somebody who wasn’t important enough to you to invite to the big day. It can be very difficult for divorced or single parents of the bride and groom at weddings, especially if the other spouse isn’t alone. Rather than leaving them on their own to muddle through, make sure you talk to one of their besties – in advance – to share your concerns and make sure they’ll be by your mom or dad’s side all night. Sandy stresses that it can’t be you doing that job on your wedding day. Some couples avoid registering because they don’t NEED anything, or they don’t want to seem greedy. The problem is that most wedding guests are going to get you a gift, whether or not you have a registry. Sandy explains why the struggle is real, and how you’ll end up stashing an ugly vase until the aunt who gave it to you comes to visit. Sandy interviews guest Elizabeth Carroll, co-creator of the real Marriage Boot Camp relationship counseling program about the differences between the TV show and the real thing. Is there always so much drama??? More information about Marriage Boot Camp programs and retreats is available at www.marriagebootcamp.com.